Alyssa was nominated by a patient who wrote not just one, but two lengthy emails to the hospital singing praises about the care he received. In his letters, the patient focused frequently on Alyssa’s approach to caring for patients as a whole. He raved about her ability to encourage and reinforce behaviors that would help him feel better physically and mentally. He also noted how Alyssa used her experiences to coach and mentor fellow nurses. While the patient originally hoped to attend the DAISY ceremony in person, he was unable. In his absence, he sent several pints of different flavors of ice cream from Coneflower Creamery. He wanted the ice cream to symbolize the variety and quality of care that many nurses provided during his stay. Read more about Alyssa's story on BestCare Today. The DAISY Award is a nationwide program that rewards and celebrates extraordinary skill and compassionate care given by nurses every day. Nurses can be nominated by anyone, including patients, family members, physicians, supervisors or peers. 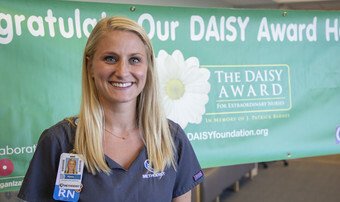 To nominate a nurse at Methodist Hospital or Methodist Women’s Hospital, visit www.bestcare.org/daisy.